Hey guys! As you know I'm a huge addict of Instagram and am on every day posting pieces of our life, blog updates, bits of inspirations and so on, but the reason I love it the most is interacting and chatting with you guys-my friends and sweet followers, and filling my feed with the most inspiring and beautiful accounts I can! @sundayflk | mostly based around vegan and vegetarian food and food preparation, I don't think there is one image in the sunday folk feed that I wouldn't print out and frame if I could. Even managing to make wilted greens look appetizing and beautiful, this account will be a forever favorite. @fellowmag | if you love pictures that give you a feeling you need to escape to the mountains and live a more rustic/simple/artistic life, this is the account for you. breathtaking landscapes, rustic living, and lots of plaid and wood.haha Perfection. @gingerdiaries | Nikki's pics always give me the feeling that I need to slow down and smell the flowers, and also visit her home of Belgium, and Paris which she gives glimpses of here and there. Fun Fact: Nikki was one of my very first blog friends and button swappers back when I'd barely begun writing in this space. @garancedore | she is a powerhouse of talent and success, and her vibrantly edited photos of the candid details of city life and her travels keep my double tapping all day long. Also she looks like she would be such a blast to hang out with, and I hope I get to meet her one day. I hope you've been having a great week so far and all that. I'm working a bit to recover from a really just unlucky week last week, where it seemed like everything that could go wrong was happening one right after the other.haha But we've been enjoying great weather so far and are having better luck all around, so I'm good! 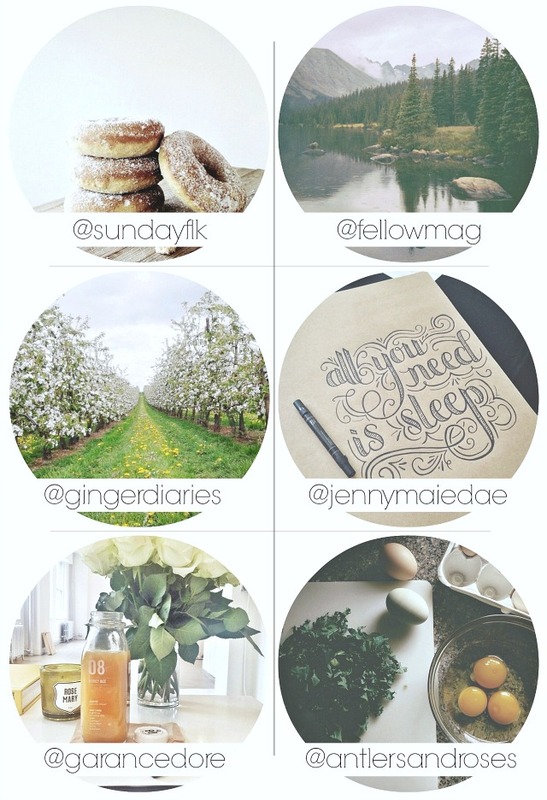 Found some fabulous new people to follow on IG...thanks so much for sharing!!! One of my recent faves is @symmetrybreakfast. Thank you for all those links. as weird as it sound i am a instagram newbie and i know less than nothing about it! i also now that it should definitely change as everyone seems to love it! these are really pretty blogs and very helpful too! thanks for the recommendation!